The second phase of the Sins of A Solar Empire: Rebellion beta went live this week, so I spent some time playing with the new units and factions to figure out how Rebellion changes the slow, strategic pace that the space-based RTS Sins of A Solar Empire is famous for. While the average match remains the same (you'll still spend hours conquering planets and blasting pirates), the division of each side into Loyalist/Rebel factions and the addition of four new victory conditions make playing Sins of A Solar Empire: Rebellion feel like a new adventure. 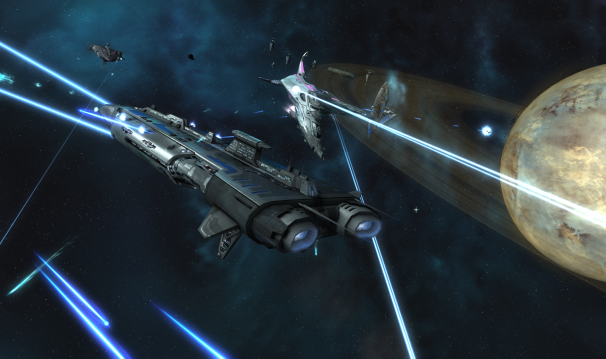 If you’re unfamiliar with Sins of A Solar Empire, thanks for clicking on this headline! You’re clearly an adventurous soul, which suggests you may enjoy exploring the many spaceships, tech trees and diplomacy options Sins places at your disposal for the sole purpose of conquering a galaxy. 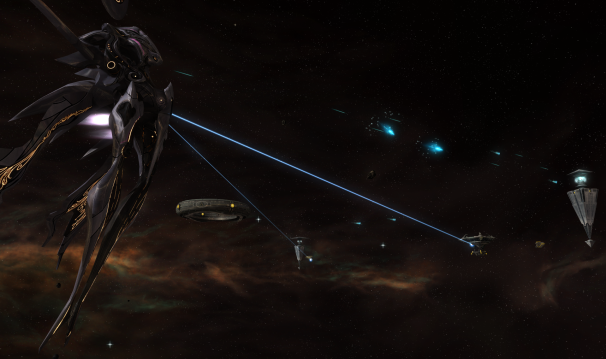 Ostensibly, it’s a real-time strategy game set in space. But that’s too simple to encapsulate what it’s like to play Sins of A Solar Empire. In a typical play session, you must balance your attention between exploring the galaxy, managing your economy, funding technological research and manipulating diplomatic relationships with other intelligent players (whether those intelligences are human or artificial is up to you). Oh, and also there are pirates who periodically raid your settlements, but they can be hired to attack other players instead! Every match is a skirmish between 2-8 human or AI players (there is no single-player story or campaign) and games often last for 3-6 hours. So while Sins of A Solar Empire is technically a futuristic RTS, it plays less like Starcraft II and more like a fast-paced Civilization 5. In space. Titan ships are really, really big. Every match begins with each player choosing to play as either the Advent, the TEC or the Vasari, and the Rebellion expansion basically doubles your options by splitting the three races into unique Rebel and Loyalist factions. This represents the galactic infighting that occurs as part of the Sins storyline, but practically it means that when you purchase Rebellion each of your favorite factions will split into two sub-factions with new units and abilities. As an example, consider my prior experience playing the original Sins of A Solar Empire: as an Advent player I enjoyed building a big fleet of small, specialized ships (strike fighters, bombers, and support drones) and using them in conjunction to take down larger capital ships fielded by the TEC and Vasari. It’s a common strategy (though certainly not the only one available to Advent players) that still works in the Rebellion beta, especially if you stick with the Advent Loyalists; but hop over to the Advent Rebels instead, and you’ll find your familiar Advent play style bolstered by the ability to resurrect dead units and sacrifice planets to damage your enemies. During my time with the Rebellion beta I found these new abilities altered how I play the game, causing me to become more cavalier about sacrificing units and come to view planets as both valuable resources and sneaky ways to do a little damage to enemies encroaching on my territory. 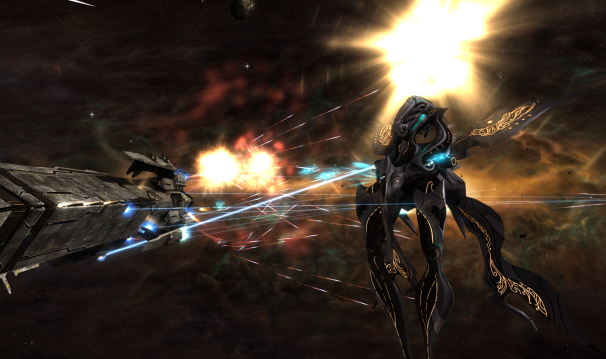 Zooming in close during ship-to-ship combat looks better than ever in Sins of A Solar Empire: Rebellion. The new factions and their intriguing abilities are the biggest change to Sins, but there are a few other new features in the Rebellion beta that are worth mentioning, including a bunch of new units and even two new classes of ship: the Corvette and the Titan. The Titans are the biggest change, literally; every faction can now build a unique Titan that's bigger than anything else on the map and requires multiple production stages to complete. Other players are alerted every time you complete a stage of your Titan, and if you can manage to protect it until it launches (since the Titans are basically the size of planets, their staging facilities are really hard to hide) you'll have a super-unit that can lay waste to enemy defenses and can only be defeated by a massive enemy fleet (or another Titan). Rebellion also includes new victory conditions (Occupation, Last Flagship Standing, Last Capital World Standing and Research) and lots of minor graphical updates to make everything look better and run smoother on your Windows PC. The expansion is scheduled to release in June 2012, and should be available for purchase on Steam for $40. I didn't notice any significant graphical glitches or game-ending bugs in my time playing the Rebellion beta, though all the new factions, super-units and win conditions seem like fertile ground for gameplay balance patches to spring up in the wake of Rebellion's release.